Kat Black's Golden Tarot is a digital collage reproduction of a tarot deck that might have existed in the Middle Ages or early Renaissance era by using artwork from that time period. At that time Tarot was predominantly a card game for royalty. The symbolism is mostly true to the Rider-Waite deck so in actuality this tarot is a blend of modern and medieval influences. 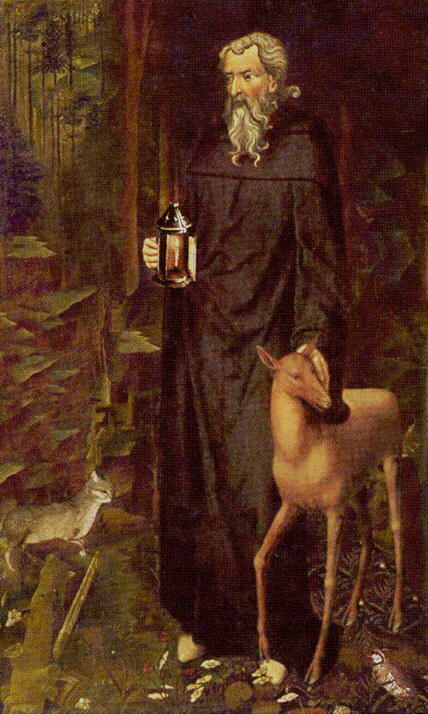 An interesting card is The Hermit, where we see St. Francis of Assisi standing in a forest, holding a lantern, with a deer at his side. In the background we see a gray cat stalking a quail.